I am often asked why I collect stamps showing shells. Like many children I collected stamps, and this continued into my student days, although the hobby then drifted into the sidelines. In the mid-'70s I was very fortunate to spend two years working in Jamaica, where my wife and I became enthusiastic scuba divers. The diving there is not the best in the world but there is a rich variety of marine life, with shells aplenty. We started collecting and ended up with a fair representation of the shells of Jamaica – over 200 species. When we returned home to England in 1978 I thought it would be interesting to combine the two hobbies of stamps and shells; I decided to collect all stamps showing shells as part of their design, and also to collect all the identifiable shells which appear on stamps. Little did I realise the enormity of the task! Research started with scanning every page of Stanley Gibbons' stamp catalogues, as well as the very few published (at that time) lists of shell stamps. The decision to collect all mollusca complicated matters, as other lists did not include shell-less molluscs: i.e. nudibranchs, slugs and most cephalopods. 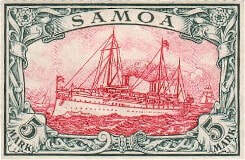 The number of stamps rapidly grew into many hundreds and then thousands, and the variety of shells also expanded. In 1982 I found an article in the magazine Foreign Stamps entitled "Shells on Stamps" by David Feld, and for the first time I learned about the British Shell Collectors' Club. Without delay I joined the Club, and was warmly welcomed by members, several of whom were also interested in stamps. In 1988 I produced a booklet listing shell stamps in systematic order (as opposed to country of issue order) and in 1997 Stanley Gibbons published a much more comprehensive listing called "Collect Shells on Stamps" as part of their series on Thematic Stamps. These publications led to my meeting many other shell stamp collectors from all parts of the world; we have shared lists, so that a comprehensive list of shell stamps can now be produced, and it is unlikely that there remain many "unknown" shell stamps. It all started as long ago as 10 June 1859 when the Bahama Islands included a stylised Strombus gigas on their first stamp; this stamp is now catalogued at £4,500 in mint condition and would be a prize in any collection (not yet in mine, sadly). The Bahamas issued many stamps until 1959 showing a stylised S. gigas, but the award for the first "realistic" shells on a stamp goes to Ryukyu, a chain of islands between Japan and Taiwan; they issued a definitive set of stamps in 1950 on which the 5 yen value showed Strombus luhuanus, Lambis lambis and Decatopecten radula. Since then more and more issues have been released, and many stamps show the shells in remarkable detail, often with the living animal shown in full detail. Some 230 different countries have produced well over 5,000 shell stamps, illustrating over 900 identifiable living molluscs, as well as over 38 different fossil molluscs. The great majority of illustrated shells are gastropods, and it is perhaps surprising to learn that Turbinella pyrum features on more stamps than any other shell; a stylised sacred chank of India (the left-handed variety) is shown on no less than 200 different stamps, the great majority from Cochin or Travancore, two feudatory states of India; most of these come in numerous varieties and also with "official" overprints, making over 400 altogether; Travancore even used T. pyrum as the watermark in the paper the stamps were printed on! The most represented "realistic" shell is Strombus gigas, which is shown on the stamps of 25 Caribbean and neighbouring countries. Cones take the prize for the most popular family, with 76 different Conus species or subspecies being illustrated. Stamps do not only show popular shells; perhaps the smallest stamp shell is Smaragdia viridis, while the largest is undoubtedly Tridacna gigas. Geographically the greatest number of illustrated shells and issuing countries are in the tropical areas of the world, but countries as far north as Iceland (Buccinum undatum) and as far south as the British Antarctic Territory (a set of fossil molluscs) have shown molluscs on stamps. Most shell classes are represented, although it is of interest that no identifiable tusk shells have ever appeared on stamps, and it was not until 1996 that a chiton was shown on an actual stamp (New Zealand), although two chitons had previously appeared in the borders of miniature sheets. Land shells are moderately well represented, but it took until 1999 for a realistic terrestrial slug to appear on any stamp (Cambodia). Other shell-less molluscs are better represented, with many nudibranchs and cephalopods beautifully illustrated. Collecting shell stamps provides enormous variety; it offers a great challenge not only to collect the actual stamps (not always easy from many obscure countries) but to identify the shells on the stamps; while identification is often easy, and the name given on the stamps is correct, this cannot be safely assumed and much time is spent poring over various shell books and pestering more knowledgeable colleagues with requests for help. It is up to the collector to decide whether to limit their collection just to those stamps where the shell forms the major part of the design, or to include stamps where the mollusc is an incidental part of the stamp, or stamps where there is only a stylised representation of a shell. The latter would include the high-value "seahorse" stamps of Great Britain issued from 1913 to 1934 which I believe show Brittania riding in a stylised scallop shell; or the German Colonies high-value "Yacht" stamps, which include stylised scallops in the lower corners of each stamp. Some collectors may study a "theme within a theme". Many paintings shown on stamps include shells, the most famous example being Botticelli's Birth of Venus, with Venus standing in a scallop shell; other shells shown in paintings include Haliotis, Strombus gigas, tritons, Cassis cornuta, Conus marmoreus, Cepaea nemoralis, nautilus shells and various oysters; 46 different artists are currently represented in this sub-theme. Or you could decide to study stamps showing only living animals – all the nudibranchs, squid and octopi as well as numerous shelled molluscs. Shells used as musical instruments are shown on over 40 stamps. Shell money is interesting, as several countries show stamps with this early form of currency, but only Uganda actually issued stamps with a "shell" currency: the famous typewritten stamps of 1895/96 with values in cowries, although no shell is actually shown. Whatever your interest there is no end to the hobby. New issues appear almost every month, and it is a challenge to keep up to date. Old stamps may be very scarce, and only become available for purchase one or twice in a lifetime (even then, most of us would not consider paying in excess of £10,000 each for some of the overprinted Togo "Yacht" stamps). If you collect the shells as well, most are relatively easy to obtain, but some, such as rare cones, are not, and will strain anyone's pocket. The hobby will keep me going for a long time and may lead to more displays at this and other societies (stamp clubs welcome such displays). If you are looking for a way to expand your conchological interests then consider stamps - you won't he disappointed. The table shows the very wide variety of shells which are represented on stamps; most shells can be identified at least to family level, but there are some which cannot be identified to the specific level. There are many other stamps which include molluscs which are too stylised for any attempt at identification. The list is complete to the end of 2002, but does not include varieties or most miniature sheets. This article by Tom Walker was first published in our magazine Pallidula in October 1996.